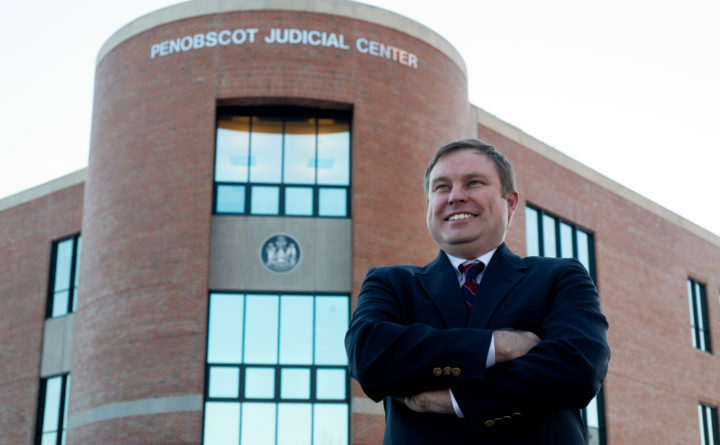 Aaron Frey, Maine’s attorney general-elect, in front of the Penobscot Judicial Center in Bangor. Aaron Frey was the student body president at Saint Anselm College when George W. Bush made a campaign stop at the college in Manchester, New Hampshire, during the 2000 presidential primary. A Bangor native, Frey had decided to attend Saint Anselm largely because its location in the Granite State — site of the first-in-the-nation presidential primary — offered someone with a keen interest in politics the opportunity to meet presidential candidates and others on the campaign trail. But given the opportunity to introduce Bush during his Saint Anselm appearance, Frey refused because he was working for Democrat Al Gore. It wasn’t a snub of the then-governor of Texas. It had to do with fairness, Frey said. “It wouldn’t have been fair for someone who was working against him to introduce him,” Frey said last week. As the 39-year-old prepares to step into his new role as Maine’s attorney general, those who have worked with Frey often mention the lawyer’s sense of fairness. He’ll be sworn in as the state’s top law enforcement officer on Jan. 4, after working as a criminal defense lawyer based in Bangor and serving six years in the Maine House representing parts of Bangor and Orono. Former state Sen. Roger Katz, an Augusta Republican and fellow lawyer, served with Frey on the influential, budget-writing Appropriations Committee. Frey was born in Bangor in 1979 to Michael and Cynthia Frey. His father worked for what was then the Maine Department of Human Services, and his mother was a nurse. He will be the seventh attorney general from Bangor but the first since 1925, when Raymond Fellows held the position. The family moved to Dixmont when he was in the fifth grade, and Frey graduated from Nokomis HIgh School in Newport in 1997. His interest in politics and music was evident then. Frey attended the Boys State and Boys Nation civic leadership programs, and he played percussion in the marching and jazz bands. After graduating, Frey went to Washington, D.C., in 2001 where he worked as an educator and lobbyist for the National Court Reporters Association. He returned to New England four years later to attend the Roger Williams University School of Law in Bristol, Rhode Island. He returned to Bangor in 2008 and worked with lawyers Stephen Smith and Julio DeSanctis. Smith’s office is now in Augusta, and DeSanctis, a longtime fixture in northern Maine courthouses, died in September 2011. Frey said that he’d considered running “for some office someday” but wasn’t sure the State House was where he should start. But fellow attorney Joseph Baldacci and then-state Rep. Adam Goode, both Bangor Democrats, thought otherwise and approached Frey about running in 2012. “I said, ‘No,’ at least twice,” he said. Frey regained the seat Democrats lost in 2010 to Jim Parker in the Republican wave that swept Gov. Paul LePage into office. “I knocked on a lot of doors, and I had a lot of support from other members of the House and friends and family,” Frey said. He was re-elected in 2014, 2016 and again in November, though he was never sworn in for his fourth term because, by that point, he was his party’s nominee for attorney general. The district he represented included a portion of Bangor that included the tree streets along with a small section of Orono. When it became clear last year that Mills was going to try to succeed Gov. Paul LePage, potentially opening up the attorney general’s office, Frey stayed focused on his work in the Legislature. But the seed of the idea to run for attorney general had been planted the first time Frey won an election. Glazier, a well known lawyer who practiced in Bangor for more than four decades, died in November 2017. Maine is the only state where the state Legislature selects the attorney general, so Frey did not start campaigning for his new job until after Election Day — when it became clear that the position would open up with Mills’ ascension to the governor’s office and Democrats would use their expanded legislative power to determine who would serve as the next attorney general. Frey didn’t start winding down his law practice in Bangor until early December, when his colleagues in the Legislature endorsed him over four other Democratic contenders — Tim Shannon of Falmouth; former state Sen. Mark Dion of Portland; former attorney general and current state Sen. Mike Carpenter of Houlton; and Augusta resident Maeghan Maloney, the district attorney in Kennebec and Somerset counties. Frey said his priorities as attorney general include being “more proactive” in fighting Maine’s opioid crisis, working with law enforcement and the Legislature to implement reforms to the criminal justice system, and improving the state’s relations with the federally recognized Native American tribes in Maine. Frey, who has been a solo practitioner and has little management experience, will oversee a department of about 115 lawyers and more than 80 support staff. He said he’ll spend his first days on the job listening and learning from department heads and longtime staff. “I’m honored and humbled at the trust that has been placed in me,” said Frey, who will continue living in Bangor. His colleagues in the defense bar and the prosecutors he’s worked with in Bangor all said he’s a great choice for the job. Her new boss, District Attorney-elect Marianne Lynch, a Republican, said she was thrilled that Frey was going to be the state’s top prosecutor. She predicted that he would bring a “balanced approach to the job,” especially in responding to the opioid epidemic. “Through his legal work he has witnessed personally the devastating impact addiction has had on our Maine communities by destroying young lives and devastating the families of those left behind,” she said. Lynch’s Democratic opponent and Frey’s officemate, Joseph Belisle, described Frey as thoughtful, compassionate and diligent.